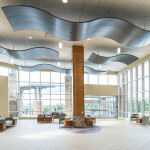 A. Martini & Co. served as the General Contractor for the four-phase renovation of various departments on the first and third floors of Frick Hospital. 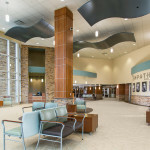 Phase One included a full makeover of the Cardiology department on the third floor. 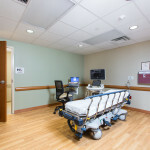 This was a Level 4 ICRA contained space that involved a great deal of coordination with the hospital to relocate the staff initially and get them back in on a non-negotiable predetermined end date. The aggressive schedule included entire demolition of the space and fireproofing of the whole ceiling and its structural members. 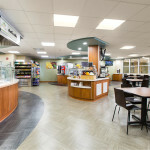 The fit out provided a new staff lounge, reception areas, exam rooms and offices. Throughout the entire project, A. Martini & Co. worked closely with the end user groups/departments to incorporate all of their changing needs. Due to neighboring departments that were in operation 24-7, a great deal of coordination and communication was required to avoid disruption to those areas of the hospital. Our team also had to coordinate daily with a number of user groups/departments outside of the construction space due to the required routing to get from the loading dock into the construction space. 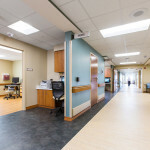 This path through the hospital made it imperative that A. Martini & Co. and its subcontractors paid the utmost attention to ICRA and general patient traffic flow for the duration of the phase. 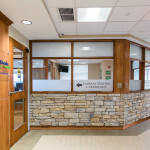 The first floor renovations could not begin until the third floor was compete because it involved the relocation of the Cardiology Team from their temporary space back into their renovated department on third floor. 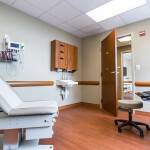 Our team coordinated with Excela Health, and despite the groups taking roughly one week longer than anticipated to move, was able to maintain the originally selected end date. The first floor space to be renovated is near the main entrance of the hospital and thus, is a much more heavily traveled area. 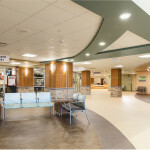 As a result, there were three main phases required to maintain proper patient flow through the corridors and a number of sub-phases to ensure proper ICRA measures were preserved as the corridor upgrades were also completed. 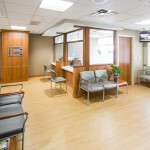 The first phase on the main level was the conversion of existing Blood Draw areas into new second-step waiting rooms, inside each department. 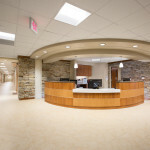 The second phase involved a shutdown of the MRI suite, X-ray suite and build out of a new staff lounge on the first floor. 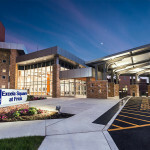 The MRI and X-Ray shutdown required critical coordination with the hospital as it required our team to complete all of the finish upgrades in as little time as possible to be ready for Frick Hospital’s Facility Department and Seiman’s to install a new unit. 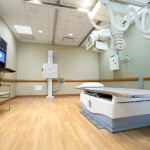 The final phase incorporated renovations to the CT suite, Women’s Center and build out of new blood draw labs. Similar coordination was required for the CT suite to that of the MRI however, in addition, A. Martini & Co. also built a temporary walkway to aid the hospital in accessing their temporary mobile CT unit, which was located by the ambulance bay. Because Frick Hospital wasn’t able to relocate the Women’s Center Imaging Services, our team worked shifts at all different times of the day based on when the Imaging Services area had patients scheduled. 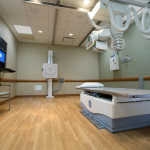 The coordination throughout all phases went incredibly well and allowed Frick Hospital to maintain all of its Imaging capabilities and general patient care throughout the construction phases. A. Martini & Co. also worked closely with Excela Health vendors which included data and security. To aid in the coordination, we utilized weekly look-aheads at each project phase meeting to synchronize any required utility or corridor shutdowns. Additionally, we created daily breakdowns of those weekly look-aheads for the highly critical areas (I.e. 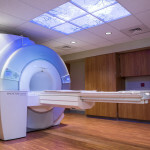 MRI, X-Ray and CT).